On the beautiful Sunday before Labor Day, my wife and I were craving some sushi. We had been for a while. Having always had good experiences at Yosaku, we decided that would be the place to quench our sushi desires. They have a great outdoor area and we got there shortly after they opened so we knew there would be plenty of seating inside or out even though they tend to be quite busy. I’m actually not a connoisseur of sushi. I love the fish, the rice, and the seaweed wrap, but I detest the raw fish and avocado that come in almost all sushi. I’ve tried them a number of times and I just can’t bring myself to enjoy those ingredients. Contrary to common belief though, sushi really just refers to the vinegared rice that is part of the dish. So when my wife first took me to Yosaku, she hooked me by suggesting options without either raw fish or avocado. When we arrived, we got a great seat outside right away. Left with menus, we perused them and were quickly visited by a waiter asking if we wanted drinks. We hadn’t decided yet, so he said he’d come back shortly. We finally decided on some beverages and the waiter took our order. My wife went with her usual chardonnay and I settled on an Asahi, a beer I had never tasted. We received our drinks a bit later and I couldn’t help but laugh when my bottle said “The Beer For All Seasons”. I was happy I didn’t order it at the wrong time of the year. It wasn’t great, but not bad either – slightly better than your average, mass-produced, American beer. Though I realize that many would still feel it wasn’t good, I didn’t mind it, and it was only four bucks, so it wasn’t masquerading as premium ale. It was time to finalize our food orders. I was very hungry and ready to try something new. Yosaku has an extensive menu including lots of appetizers, dinners, sushi, and more. I was focused on the sushi even though my options were relatively limited based on my taste. I had a general idea that I was going to return to some old favorites, but needed a new item to add to the approved list. I decided that I would try the Maine crab roll. Yosaku has a pretty good selection of Maine seafood items and I figured I should try one. My wife started with edamame. I added an order of the Yosaku – tempura fried spicy tuna with a special sauce while she got an order of the Spicy Tuna Rolls. We finished our ordering frenzy by each asking for the spicy scallop rolls – broiled scallops in a spicy sauce. We assumed those would be the finishing touch as they tend to take a while to come out based on our previous experience there. Before long, our edamame, and then shortly thereafter, the Maine crab rolls came to our table. I was excited. 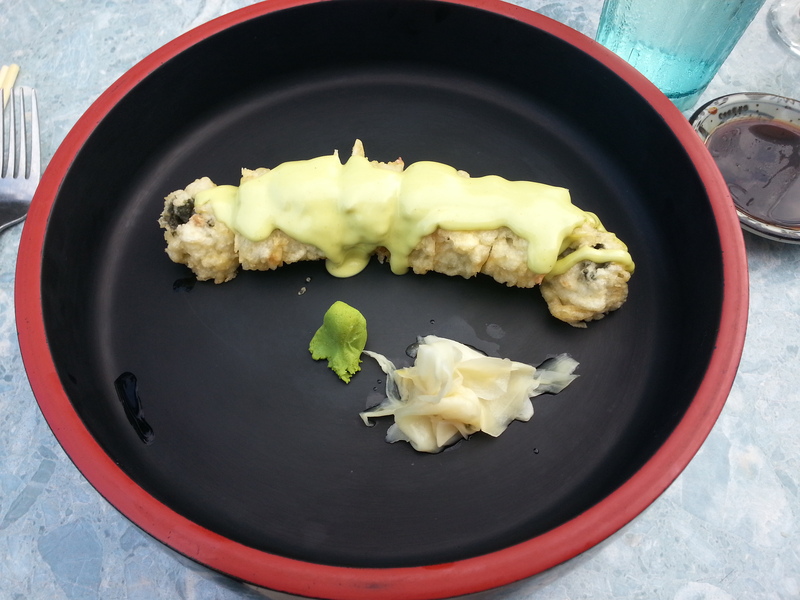 A little mound of wasabi and a pile of pickled ginger accompanied my crab-topped seaweed and rice rolls. I took my little soy sauce dish that was at the table and filled it with the sensational salty condiment, though it was the lower-sodium version to prevent a blood pressure burst. There was a soy pouring problem though due to an issue with the pour-top and it created a mess. Some of the soy went into the bowl with the rest decorating the table in a soy sauce splatter. Before I go any further, I should tell you my dirty little secret. I love condiments, little bowls of extras, sides of additional ingredients, and the like. The sight of delicious wasabi, pickled ginger, and soy sauce to throw on my sushi was music to my mouth. A tiny, little tear came to my eye as I watched the traditional sushi condiments rest before inevitably lining my mouth with a magnificent flavor combination. Ready to eat my rolls, I realized that I only had chopsticks and no silverware. I don’t use chopsticks due to my inability to put food in my mouth with them. But I was hungry, so I took the wooded utensils and used them to throw some wasabi and ginger on my roll. Then I took my hands, plopped it into the soy and dumped it in my mouth. The plain rice and seaweed wrap topped with Maine crab was complimented beautifully by the ginger, soy, and just enough wasabi to burn my nose hairs. My new crab roll adventure was a success. After eating both of those and helping my wife with the edamame, it was time to start our main course. The spicy tuna and Yosaku came out with perfect timing. I usually have the first bite without any condiments just to get a sense of the flavor by itself and figure out how much condiment it actually needs. The Yosaku has some of my favorites, spicy and tuna, so I knew it couldn’t be bad. It wasn’t. But one thing definitely stood out about roll. It was deep fried and topped with sauce, so any idea that it was going to be healthy was incorrect. If you’re looking for something a little more on the healthy side, don’t get the Yosaku. However, if you’re just looking for a delicious roll of sushi with some cooked seafood, it’s a great choice. It had a little spice, decent tuna flavor, and with the condiments added – and without them too – was full of flavor. My wife loved her raw tuna roll. Next came the spicy scallop roll for each of us. Again, it was topped with a sauce, though this one was not deep fried. My wife exclaimed that it was one of her favorite foods anywhere around Portland. The chopped scallops were both in the roll and in the sauce. They were a little spicier than my spicy tuna which I liked. Of course, I piled on copious amounts of the sushi add-ons. Then I continued to shove scallop rolls into my mouth until they completely disappeared. It wasn’t easy as they break pretty easily, but I was determined and experienced total success. Our hunger was satiated and we were pleased with the experience at Yosaku. Our meal came to the mid-$60 range before tip, which wasn’t too bad considering we got four full sushi orders, a two-piece, the edamame, and two drinks. While I am not someone who has had a lot of sushi, I can tell you that Yosaku is a solid choice. I don’t really have anything to compare it to, but if you aren’t fond of traditional sushi, I can definitely say that Yosaku might still have something for you. This entry was posted in Portland, ME food on September 9, 2013 by peterpeterportlandeater.